Edsall Road, a Celtic band from Northern Virginia playing to a crowd in Phil and Teresa Metcalfe’s living room in Sterling, Va., had just put the finishing touch on a set of Irish reels when, in the audience, a cell phone trilled — in nearly the same key as the band’s last tune. That made it almost OK. Right there you have one distinctive feature of the house concert, a live-music format that’s pretty much what it sounds like: acoustic music played in one’s house for listeners to enjoy. It’s informal, it’s intimate, it’s packed with music lovers who’ll forgive a cell phone if it’s in tune. Generally serving as showcases for contemporary or traditional folk music, house concerts can and do feature other musical genres: bluegrass, jazz, classical, world, blues and more. Because the performance space is small, other types of music — hip-hop, go-go, metal, opera among them — are better suited to a club or fine arts hall. Those who host house concerts are typically avid music fans committed to introducing artists they’ve hand-selected and whose music they adore to new audiences. For instance, Julia Gordon and Geoff Berman, who last month hosted the Robyn Helzner Trio in their Silver Spring home, describe themselves as “proselytizers” of the musicians they bring in to play. In fact most house concert hosts are equal parts emcee, social butterfly and impresario. “I’m there to make sure everyone is comfortable and that everyone has a good time,” says Karen Helbrecht of Alexandria. Along with her husband, Gordon Johnston, Ms. Helbrecht, who plays cello and banjo, has hosted house concerts — often in partnership with the Folklore Society of Greater Washington — since 2002. The Lantises have been house concert hosts since late 2005 in an effort to encourage their circle of fellow music-lovers to turn off the tube, meet new people and savor an up-close-and-personal musical performance. “We want to boost what we think is a more satisfying type of entertainment,” Mrs. Lantis says. A typical house concert is a hybrid of party and performance. Musicians set up their instruments and gear in the host’s great room, living room or kitchen, wherever a phalanx of folding chairs or a clever rearrangement of comfy couches fit best. Those who have called ahead to reserve a seat — and often have paid in advance, depending on the host’s policy — may arrive with onion dip or a bottle of wine to contribute to the evening’s repast. Some house concerts are known for their potluck food, while others are simpler, cake-and-coffee affairs. Before and after the music, as well as during the typical house concert’s intermission, there’s free time when musicians, hosts and listeners mingle — to talk about what inspired a particular song, to buy or sell the performer’s CDs, to catch up with old friends. That’s when the social aspect of a house concert tends to blossom. “It’s almost like a networking event that takes on a life of its own,” says John Simson, executive director of SoundExchange, a D.C.-based nonprofit organization created to collect royalties for musicians. Mr. Simson, whose career in music has spanned everything from serving as Mary Chapin Carpenter’s manager to practicing entertainment law, has both attended and hosted house concerts. “You find them everywhere now,” he says, noting that some nationally touring artists will often use house concerts as “routing dates” — if they know they’ll be playing a venue in, say, Charlottesville on a Saturday night, they might slot a house concert in Alexandria for Sunday on their way back up north. “It’s a trend that’s really growing,” he observes, noting that music conferences, such as those sponsored by the Folk Alliance or the Americana Music Association, are now offering workshops to give artists and bookers tips on how to find and book house concerts. Listeners usually pay $10 to $25 each to attend a house concert; many choose to ante up more on arrival simply because they love the music and the low-key format of the event. Most hosts turn all of the collected funds over to the performers, though some may deduct the cost of refreshments. When CD sales augment ticket sales, the musicians enjoy a performance that’s not only creatively satisfying but lucrative as well. “Sometimes I’m surprised at how much [money] we have made at a house concert,” says Jen Smith, who with husband Scott performs with their band, Naked Blue, whose music she describes as Americana-inflected pop. The couple live in Baltimore, and they include house concerts in their steady run of gigs up and down the East Coast. What musicians earn by performing in clubs, bars, concert halls and other traditional places for live music varies depending on the city where the gig is played, the venue, number of drinks sold, or whether the owner is in a good mood. For example, a band playing in a restaurant may be guaranteed a set payment by the owner, such as $250, with additional proceeds attached to the amount of food sold or patrons drawn. Or the artists may be earmarked a portion of the cover charge patrons pay to enter the venue. Not surprisingly, these percentages are often smaller for the artist than for the owner; members of a five-piece band, for example, might clear as little as $25 or $50 each after the money is split among the musicians and the venue. By contrast, a performer at a house concert is likely to end the night with $500 and up, in part because the host almost never diverts any of the money. When the audience numbers 70 people — as it tends to do with Cheryl Kagan and David Spitzer’s Folk N’ Great series in Rockville — performers may be looking at a four-figure evening. The money-making potential of house concerts is an obvious plus for musicians like Edsall Road and Naked Blue, but it’s hardly the only draw. On the other hand, a house concert “is more personal,” she says. Yet Ms. Smith cites a paradox: The intimacy of the house-concert format, the very thing that attracts many participants, can also be the most challenging thing about them. With virtually no separation between musicians and listeners, the artist may feel a vulnerability he or she wouldn’t experience in larger rooms where listeners’ faces are obscured by spotlights and missed notes aren’t quite so obvious. Mr. Metcalfe says some musicians have turned down his offer to perform in part because of the closeness of the audience. “They’ll say, ‘That’s too intimate for me,’ ” he says. Edsall Road’s flute and mandolin player, Billy White, says he got a taste of that intensity. “It was a bit unnerving at first,” he admits, describing the early moments of the band’s show last month at the Metcalfes’ home. It was Edsall Road’s first house concert. More and more, non-folk genres are finding a home in the house-concert format. For example, the music of J.P. McDermott, whose band Western Bop plays a rollicking mix of honky-tonk and rockabilly, might not at first blush appear to fit well with the cozy quarters that typify a house concert. But Mr. McDermott, captivated by the intimacy that enfolded him and his audience in October 2005 when the power failed mid-song at a Silver Spring club — and his band played on unplugged as the audience lit candles — says that ever since then he’s wanted to do an acoustic show. Named last month as 2006 Country Vocalist of the Year by the Washington Area Music Association, Mr. McDermott says he is talking with several house-concert hosts about performing. Among other things, such a gig would afford him the chance to play his favorite ballads by Hank Williams, Merle Haggard and others. Then there are the classical concerts, and those that hosts turn into benefits for a favored cause. Kristin Gilbert and Aileen Pisciotta of Falls Church sometimes combine the two: A portion of the funds received from their classical music concerts go to a scholarship fund named for Thurgood Marshall, the late Supreme Court justice who was a longtime resident of the Lake Barcroft neighborhood where the women live. Ultimately, the social component of a house concert is just as crucial as the musical one. “Most likely you’re there with a number of your friends, all enjoying the experience together,” says Lawrance Binda, a freelance writer in the District who has attended and hosted house concerts. “Some of the folks who began coming to our shows in the beginning are now very close friends of mine,” says Regina Derzon of Lake Barcroft, who hosts house concerts with husband Jim. Mrs. Derzon’s genre of choice is bluegrass. Indeed, many things separate a house concert from a night at the 9:30 Club or an evening performance at Borders. “There’s no bouncer and no cigarette or cigar smoke,” says Richard Weil, whose long-running house concert series in Takoma Park is called Weil Sing, in part for the audience singalong Mr. Weil asks each of his performers to offer before the night is through. House concerts have always hit the right notes for sociable folks who love to hang out in someone’s living room, hear tunes and mingle with the artists. Now they’re becoming the thing to do. Here’s a sampling of what’s coming up — and remember to confirm all information with the hosts through the e-mail address or Web sites provided. • Folklore Society of Greater Washington house concerts: Alexandria. The Syncopaths, March 24. E-mail mjkandg@verizon.net. • Sleepy Hollow Folk Club: Falls Church. The Kennedys, March 25. See sleepyhollow folk.com or e-mail stewart@pressroom.com. • Folk N’ Great Music house concerts: Rockville. David LaMotte and Kate McDonnell, April 21. 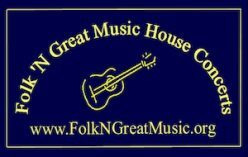 See folkngreatmusic.org. • Dawsonconcerts: Silver Spring. Terri Allard, April 21. See angelfire.com/folk/ dawsonconcerts/index.html. • Bluegrass House Concerts: Falls Church. Tony Ellis and Louise Adkins/Little Windows (Julee Glaub and Mark Weems), April 28. See lakebar croft.org/cm/arts/bluegrass.shtml or e-mail derzon@verizon.net. •Rusticway Chamber Music Series: Falls Church. Elisabeth Adkins, violin, and Edward Newman, piano, May 13. See lakebarcroft.org /cm/arts/rusticmusic.shtml or e-mail krgilbert@aol.com. Copyright © 2007 News World Communications, Inc. All rights reserved.